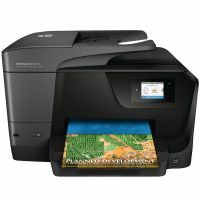 This HP Officejet Pro 8710 All-in-one is a wireless, colour, inkjet printer intergrated with Wi-Fi connectivity. With automatic duplex printing as standard, you can print on both sides of the page to save paper. With a print speed of up to 24 ppm mono 20 ppm colour and first page out as fast as 9 seconds for black and 10 seconds for colour. Print quality, up to 1200 x 1200 dpi, fax resolution 300 x 300 dpi with a transmission speed of 4 seconds per page, copy resolution up to 600 dpi for both mono and colour with a copy speed of up to 20 cpm, scan resolution up to 1200 dpi with a scan speed of 8ipm and 4 ipm duplex. The box contains HP OfficeJet Pro 8710 All-in-one Printer, HP 953 Setup Black OfficeJet Ink Cartridge, HP 953 Setup Cyan OfficeJet Ink Cartridge, HP 953 Setup Magenta OfficeJet Ink Cartridge, HP 953 Setup Yellow OfficeJet Ink Cartridge, 250-sheet Paper Tray, Power cord, Phone cord, Setup poster.